I started off with a background of a resist technique. I have used my Lyra watercolour sticks for this project. I stamped out the Heartfelt Creations words stamp in versamark then heat set with WOW clear embossing powder. 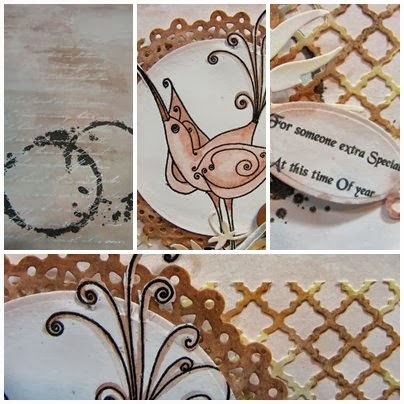 I then ran peach and brown colours over the embossing giving a resist look. I then die cut the Spellbinder Lattice and coloured this in with peach, tan and brown. The circle Dollie is from X Cut and again painted with brown watercolour paint. The bird is new from The house of Zandra and again I used the same colours. I then partly cut the tail, beak and feet and used a Spellbinder circle to complete the cut of the outside shape. Again I coloured the outside rim with peach paint. The leaves are cut out of Marianne Dies and coloured in. The words are off my computer and cut out with a Spellbinder tag. I have then added a button and ribbon. The rings on the back of the project are from Bo Bunny stamps. ← Where U’V erbina sitting…. A beautiful card Susan, a fabulous design, your wonderful colouring of the stunning image and just gorgeous details!!! BEAUTIFUL!!!! love the image 🙂 Thanks so much for joining us on Cardabilities. what a beauty! so soft and elegant! thanks for playing along at Cardabilities! Hi Susan :-). Love the resist technique and various layers you have created for this project. Love the stamp design too. What a beautiful take on the Cardabilties sketch! Such a pretty card! Love the whimsical bird! 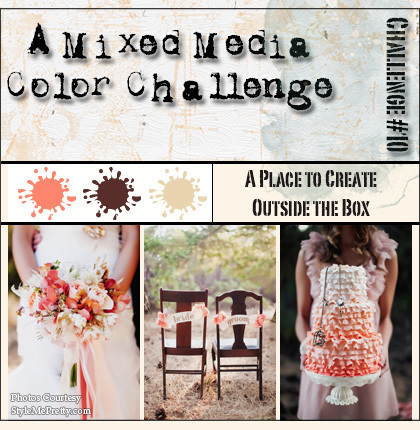 Thanks for joining along with A Mixed Media Color Challenge! Beautiful!!! I love that bird image!!! Gorgeous lattice and beautiful color!